They’re the pithy string of words that cause writers block among sweaty sleep deprived creatives. Taglines, straplines, slogans, or – as they’re apparently called in Japan – catchcopies. Whatever you want to call them, they’re an essential element of advertising. Typically short, these little fellas have just one job to do: encapsulate exactly what a brand is all about. Of course they need to be memorable, so memorable that when you think of a brand, you are instantly able to recall the slogan, and vice versa. That’s a lot of pressure for a few little words to carry. “A tagline has to be brutally single-minded. This is not the place to squeeze in lots of reasons to believe and the like,” says Jen Speirs, creative director at DDB Sydney. And so in this vein, we present 10 of the best taglines, handpicked by some award winning adlanders. 1. ‘The burgers are better at Hungry Jack’s’, Hungry Jacks. It’s a bold statement that won over GPY&R’s Film Cannes Young Lions winners, copywriter Tristan Viney and art director Carl Robertson. Now pass me that Whopper. 2. ‘When it absolutely, positively has to be there overnight’, FedEx. “Talk about a statement that galvanises a whole company. No room for ambiguity there,” says Spinach’s Willee. 3. ‘We’re for dogs’, Pedigree. Paul Swann, creative partner at The Works, is a sucker for the simplicity of this line and the way it seizes leadership of the pet-food category. 4. 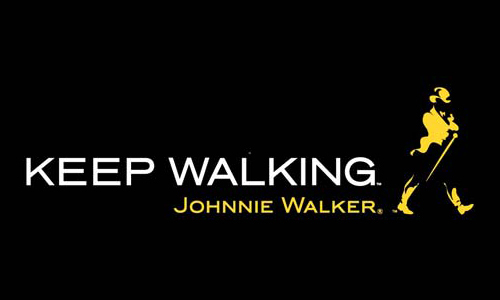 ‘Keep walking’, Johnnie Walker. Havas Worldwide Sydney creative director Stuart Turner picked this two-worded gem. “Sitting on its own without any visual or idea, I completely understand what it stands for and I can imagine my own ideas of what it could mean for different people,” he says. “It also has a lovely nod to the product name with the word ‘walk’, and allows the brand to talk about itself as well as focus on the ambitions of its consumers. 5. ‘Probably the best beer in the world’, Carlsberg. “It’s hard to make concrete claims in this category so I’ve always been a fan of the word ‘probably’ in this line,” says The Work’s Swann. Unfortunately the Danish brewing company lost confidence in the slogan that was created by Saatchi & Saatchi in 1973 and in 2011 turned back to the slogan it first used in 1957: “that calls for a Carlsberg”. The refurbished tagline was introduced to about 140 markets via the spaceman spot below. 6. 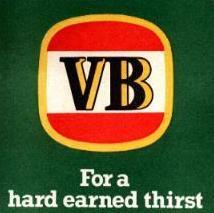 ‘For a hard earned thirst’, VB. You can’t forget this Aussie classic. “Every red blooded son of ANZAC can relate to this,” says Willee. 7. ‘What to bring when you’re told not to bring a thing’, Cadbury Favourites. It is catchy and clearly communicates the brand’s positioning. The clincher? It makes The Work’s Swann want to repeat it. 8. 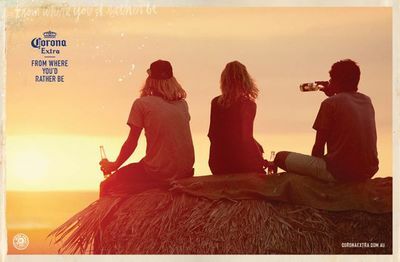 ‘From where you’d rather be’, Corona. The Corona brand immediately conjures images of sun-drenched afternoons, shaggy-haired surfers and hints of citrus. All this from just five words. For Tommy McCubbin, creative director at CHE Proximity, this strapline immediately sprung to mind when asked for his top two “because it plays to the brand’s Mexican heritage and evokes memories of drinking Coronas in the sun”. This pick is sure to put off Nike fans and lovers of the ‘Just do it’ line, but Havas’ Turner feels this old Adidas line has more gravitas. For starters, it was taken from a Muhammad Ali quote. “It’s intriguing, thought provoking, and inspires one to look at any challenge, no matter how big, as achievable. Perfect for a brand that equips you with the gear you need to do just that,” he says. The line was retired in 2011 in favour of ‘All In’ which was catapulted into the market by what the brand described as the biggest marketing campaign in its history. 10. ‘World Famous in New Zealand Since AGES ago’, L&P. This one comes from across the ditch and has a number of local fans. DDB Sydney’s Speirs says the cheeky line immediately sets up the lemon-flavoured soft drink as a likeable iconic NZ brand. “With one line they’re screaming gravitas and down-to-earth simultaneously,” Speirs says.